This article is produced as part of a recent partnership between the Project for Integrative Health and the Triple Aim (PIHTA) and the North American Board of Naturopathic Examiners (NABNE) for which the Integrator is providing media support. The partnership's goal is to stimulate understanding of naturopathic, integrative patient centered medical homes (PCMH) via portraits of ND-PCMHs in Vermont and Oregon. PIHTA is an initiative of the Academic Consortium for Complementary and Alternative Health Care (ACCAHC). "They say I was an angel who walked through the door." Melissa Porter, LPN chuckled even as the words flowed from her mouth. 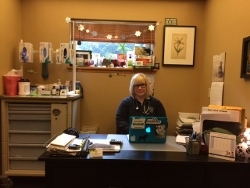 Porter, an experienced administrator and care provider in a large Portland, Oregon medical delivery organization, was referencing perspectives of her colleagues at the naturopathic physician-run Center for Natural Medicine (CNM). Change-agent may be more descriptive. Her colleagues were speaking to multiple roles Porter continues to play as clinic manager in the Center's transition to its present status as a Level 3 patient-centered primary care home (PCPCH). What does Porter do? The Center's website says "Clinical Case Manager." Her answer- before she recalled the "angel" title: "Patient care. The IV therapy. Phone triage. Urgent Care. Marketing. Find the funding opportunities to help us grow. Painter, if needed. Gardener. Be on call 24/7." She ticks off a couple others then concludes: "Basically, I'm Marty's right-hand lady." "Marty" is Martin Milner, ND. Some 32 years ago, Milner engaged a visionary project of constructing and operating a 6500 square foot, wellness and cardiology-focused naturopathic integrative clinic. The year 1983 was yet a dark age for the naturopathic medical profession. Naturopathic doctors in Oregon were operated under an outdated licensing act. Fewer than 500 licensed naturopathic doctors existed in the United States. Just 7 states had licensing. Yet Milner had a vision for his profession's future and chose to build a clinic that would be a beacon. The task in 1983 was significant. Milner would need to make a go of covering all that overhead and making a living with then very little third-party coverage of naturopathic services and a more limited scope of practice. Milner has since been chosen one of Portland's top natural doctors. He's also served 18 years as faculty in cardiology, pulmonology and endocrinology at National College of Natural Medicine for which he provides an accredited residency. Some 3 years ago, Milner chose to point his entrepreneurial energy with the Center in a new direction. He decided to convert his now 12-practitioner clinic into Oregon's first naturopathic doctor run PCPCH. This was when Porter appeared at the Center, "right when the PCPCH application was on the line" in her words. The time, remembers Porter, "was very chaotic - a lot of scrambling." The conversion to PCPCH was "a huge learning curve for a lot of the doctors." She reflects that "those from small clinics don't usually have a full understanding" of culture and practices in large payment and delivery organizations. Painted all exam rooms to make them friendlier, picked out "warm art, mobiles"
In addition, Porter engaged a series of tasks that directly related to PCPCH status as a community provider, thoroughly linked to care providers in large delivery organizations in which Porter formerly worked. They are in Table 2. Finally, Porter brought in a wound-care specialty - something she'd done in the past, clinically. This would support an important PCMH function: limiting the need for expensive ER visits. While Milner was skeptical of Porter's initiatives early on, she recalls, when he saw the potential she was creating, he "said ‘Wow!'" He was won over. For Porter, the transition to the Center was also right. She tells a disturbing story from her professional career that illustrates what drove her to work at the Center. It captures in microcosm the kind pressure to produce procedures in regular medicine that birthed the accountable care and medical home reform efforts. Porter was working in a wound care and in a hyperbaric medicine unit with a local hospital. She also served as the head of safety. While working in hyperbarics, she had a patient with dementia. Her superiors told her to run additional sessions - at roughly $1500 plus each. Porter knew that the patient, who had initially come in with a chronic leg ulcer, was deemed healed. But, in her terms, the patient had become "easy money" due to his dementia. When Porter protested, her superiors at the hospital told her to go ahead anyway. To Porter, this was anything but "patient centered care." She also considered it wasteful and questionable at the level of values. non-pharmacologic services can reduce opioid dependency. Porter's need to transition out of her prior work was further driven home when a personal health issue led her to explore the care of a naturopathic physician. In that treatment, she found values and approaches she increasingly embraced. She became uncomfortable choosing one type of care for herself, yet providing another to others. As Porter tells it, she began work at the Center intentionally in a low profile role at the front desk. Then she stepped up to help in the Center's laboratory. She began to do the Center's difficult blood draws. The job kept growing. She laughs: "Then one day I was clinical manager!" Center for Natural Medicine has chosen "3 metrics to make our practice better for Care Oregon," according to Porter. These are the Center's required quality improvement initiatives. Increasing the number of patients among those assigned who are served. The clinic has also applied successfully to the Care Oregon for funding to support some additional initiatives. One example was when the agency announced a program to support PCPCHs seeking to enhance "patient engagement" in their care processes. At the level of cost, the equation in simple: If a patient is "engaged" with the primary care team, they are less likely, for instance, to go directly to the expensive ER and be put through expensive imaging and other procedures. Engagement entails more than the "better patient-experience" leg of the Triple Aim. In that framing, "patient experience" addresses such prosaic concerns as phone services, patient-flow, parking, and wait times. Patient engagement runs deeper. From a business perspective, the relationship to the patient in a PCPCH is the opposite of that in an exercise club, for instance, where the best member is the one who pays monthly fees but never shows up at the club. A PCPCH, on the contrary, has a responsibility to reach out to its assigned members and get them participating in preventive and health-related behaviors. poverty. No shows are a big deal." Porter quickly learned that only 52% of the individuals assigned to the Center had ever seen a practitioner at the Center. She applied, and the Center received grant support from Care Oregon to help pin-pointing "why 48% have not come in." To reach more patients, the Center began reaching out via newsletter and call reminders. They also began to promote their unusual clinical attractions. They began promoting their yoga, and acupuncture as potential draws. Porter was not clear on exactly how the Center will document the outcomes of its patient engagement plan. She notes the potential to take a re-look at the percentage of patients on its panel who have received care. She shares an additional grant area with Care Oregon to which the Center has responded. "Mental health is huge" in the Center's PCPCH population. Center clinician Carlo Calabrese, ND, successfully applied for a grant "on a behavior health initiative." Calabrese, a former member of the NIH National Advisory Council for Complementary and Integrative Health, has a naturopathic practice with a behavioral focus. That program is not yet operational. The Center's basic transition to PCPCH was essentially a 1.5 year process, in Porter's estimation. Few aspects of the Center's activity were not changed in some way. A major shift was in the patient population. Porter reflects: "We were formerly seeing many people who were basically healthy. Now as a PCPCH we have many people with multiple chronic conditions. Many are in poverty. No shows are a big deal." One other area of challenge is in billing. "It's all really new for everyone,"say Porter, "figuring out how much is being reimbursed and why - whether an insurer covers acupuncture. One minute they will and the next they won't." In addition, many of the patients assigned to the PCPCH "can't afford their supplements." Porter has been "hounding Care Oregon on this." She shares a small victory: "They just said they'd cover fish oil." The clinic is also discounting some of its supplement prices for this population. "Oh there are so many successes! coming in with multiple chronic issues. had we not been a primary care home." Porter is excited as she sums up the positive shifts for the Center since Milner chose to engage the pioneering PCPCH path for his naturopathic version of an integrative medical center. "Oh there are so many successes! One that warms my heart is the people coming in with multiple chronic issues. Then you see them six months later, totally transformed." She speaks to the importance of access: "They would have never known we existed nor come in had we not been a primary care home." Porter was not yet able to provide any formal outcomes or analysis of the extent to which these positive experiences can be generalized. She has some opinions, however, on why the patients she references responded well: "Our doctors are treating the whole person. They take much more time. We provide quality not quantity. Our patients are taking part and they are partnering. We touch every patient who comes in the door. We do specialty testing. We have more services. We offer a lot of education, not just medication." Porter continued with the positive outcomes: "We've had to double staff. We're continuously offering more services to the community. Patients are getting acupuncture. Our providers are doing better. We have a stable number of patients. We're keeping people from the ER. We're diminishing the number of meds they need." What's not to like about this? Comment: The Center for Natural Medicine's experience of the transition to PCPCH is, in Porter's account, remarkably positive. The reported success in treatment following the shift in population from a relatively healthy population to a classic Medicaid population with multiple co-morbidities is particularly remarkable. Porter's report is a positive indication relative to an important perceived barrier to entry for integrative and naturopathic practice in regular medical delivery. That is, for breaking with the idea, prevalent among many who are dismissive toward these fields, that integrative care only works for the worried well. These outcomes - assuming that they will eventually be backed by experience data - also question a perspective that presently prevails at the NIH NCCIH. Presently research foci assume that complementary and integrative medicine are best viewed as health enhancements and for reduction of symptoms. Research is not focusing on the role that that integrative practice can play in turning around major conditions. These apparent successes at the Center are yet subjective. (Porter said for instance that she "hears about limited ER use while patients are hooked up to IVs.") The claims need the kinds of experience data that are anticipated to drive processes in accountable care delivered through patient centered medical homes. Will these perspectives on patient experience, on lowering ER needs and medications, be supported by population data? Here's wishing for a fruitful experience at the Center in culling data from their electronic health records. The Integrator will be back in touch with Porter, Milner and the Center staff to check in for those data. Terrific to have this initial level of sharing of this pioneering experience.